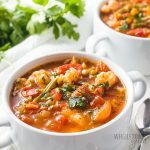 Whether you’re looking for a weight loss soup or just something to warm you up this winter, this easy low carb vegetable soup recipe will hit the spot! 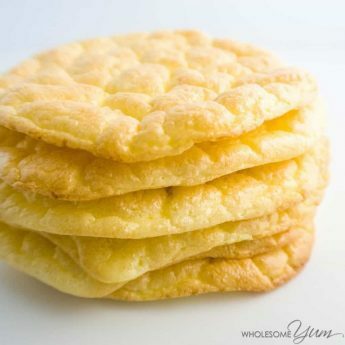 It’s naturally keto friendly, paleo, has a vegan option, and is just all-around healthy no matter your way of eating. If you want to know how to make vegetable soup that’s super simple, uses common ingredients, and takes less than 30 minutes, this one’s for you. Is Homemade Vegetable Soup Healthy? Is vegetable soup healthy for weight loss? Yes, definitely! No matter what type of diet you follow, no one can argue that a big bowl of homemade vegetable soup is healthy for you. In fact, I’d say that if your question is, “What is the healthiest soup?” – this one just might be the answer. It’s packed with so many different types of veggies for loads of nutrients, but at the same time it’s light on calories and carbs. Is Vegetable Soup Low Carb? 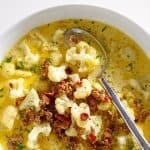 Is vegetable soup keto friendly? Yes, it can be. 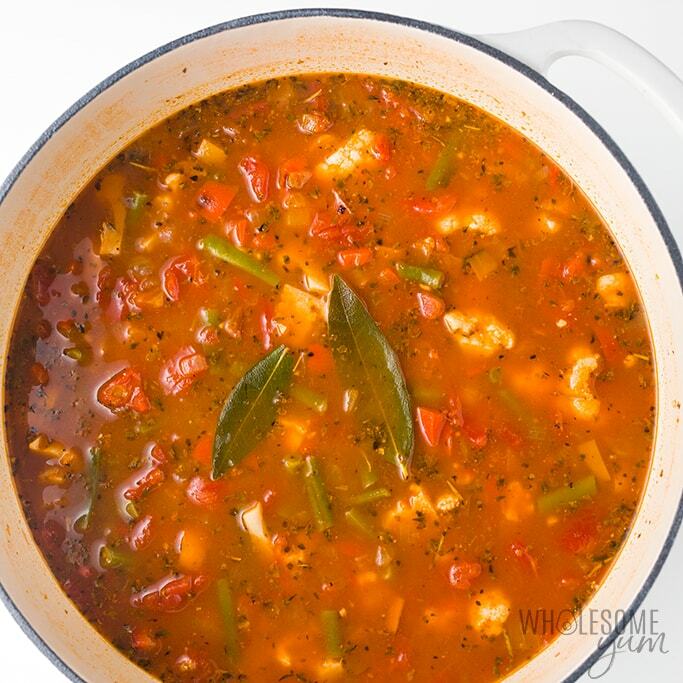 While it’s true that carbs can add up with certain types of veggies, this low carb vegetable soup recipe can fit into even the lowest carb diets. More specifically, this keto vegetable soup has 8 grams net carbs per serving. And, all the carbs come from veggies, which is always a good thing. It’s definitely the best vegetable soup recipe in my book! What Vegetables Go In Vegetable Soup? Now, I’ll show you my step-by-step process for how to make vegetable soup on the stove. It’s super fast! 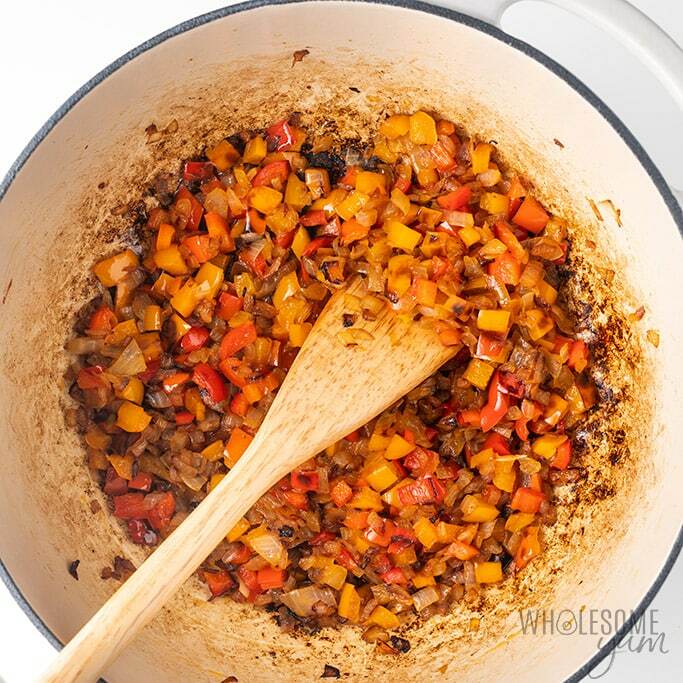 To start, saute some onions and bell peppers in olive oil until they are nice and soft. The onions should start to brown a bit. Feel free to saute to your liking! I like them nice and browned, to the point where the onions are starting to caramelize. Add the minced garlic and saute for a minute longer, to let the flavor develop. 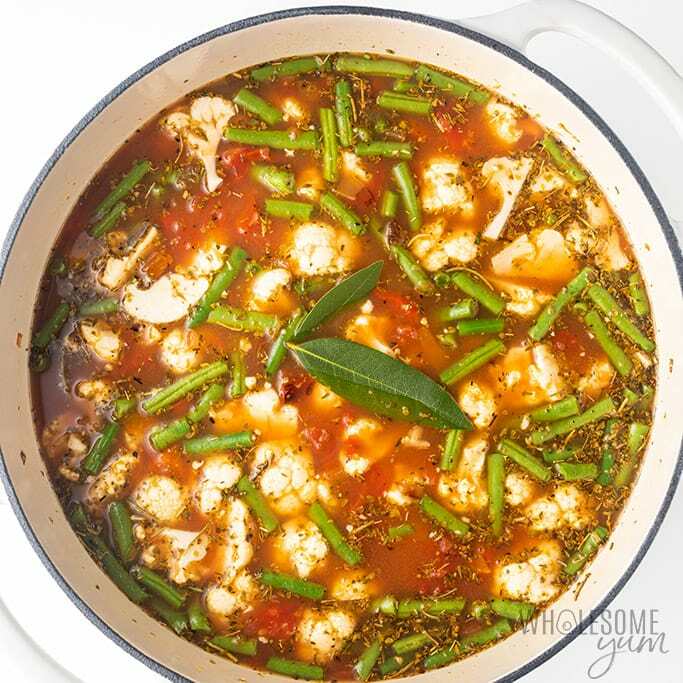 Add the rest of the soup ingredients – cauliflower, green beans, canned diced tomatoes, broth and Italian seasoning. Stick a couple bay leaves in there, too, along with salt and pepper. PRO TIP: You can use any broth you like! I prefer the flavor of chicken broth, which saves on carbs, but if that’s not a big deal, vegetable broth makes this a low carb vegetarian vegetable soup recipe (and vegan, too!). Bring the soup to a boil, cover, and simmer for 10 to 20 minutes, until the veggies are soft. I love that this is so quick! What if you want to make low carb vegetable soup in a Crock Pot instead? You can! For crock pot version, you’ll still need to saute the onions, peppers, and garlic first, just like above. Then place these into the Crock Pot along with the remaining ingredients. How long to cook keto vegetable soup in a slow cooker? Cook on 2 hours on High or 4 hours on Low. What Can I Add To My Vegetable Soup For Flavor? My preferred seasoning for homemade vegetable soup is Italian seasoning. It tastes great and saves time getting out multiple seasoning containers. And if your pantry is not fully stocked with every spice and dried herb under the sun, Italian seasoning is a good all-purpose option to buy. Paprika – regular or smoked! Sea salt – a must! Just remember that overdoing it can be just as bad as skipping the spices. Pick one flavor profile to stick to, either with a tried-and-true seasoning mix or by choosing a couple herbs and spices to focus on. In addition to herbs and spices, sometimes a soup just needs PH balance. Lemon juice or vinegar can add more acidity, while heavy cream or coconut cream can make it more alkaline. Vegetable soup too sweet? Add a splash of vinegar or a bit more salt. Vegetable soup too bland? Add more salt first as that’s the most common issue. If it’s salty enough, try more herbs and spices – see ideas above! Vegetable soup too spicy? 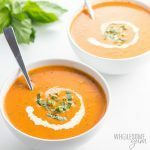 If you don’t mind changing the type of soup a bit, the best way to tame spiciness is by adding a bit of heavy cream (or coconut cream if you are dairy-free). If you don’t want a creamy vegetable soup, you can try diluting the spiciness with more broth. A splash of vinegar can also help. Vegetable soup too salty? Vinegar or lemon juice can help balance out the salt, so try adding one of these. Another good option is an additional can of diced tomatoes, because it will balance the salt without requiring you to cook the soup for longer. Vegetable soup too acidic? Similar to fixing vegetable soup that’s too spicy, heavy cream or coconut cream can tame soup that’s too acidic. Some people also recommend sifting some baking soda onto the surface of the soup, since it’s alkaline, but I haven’t tried it to verify. Yes, you can freeze vegetable soup. It freezes great! Let it cool to room temperature, then pour into airtight zip lock bags. Lay flat in the freezer until solid, and after that you can move them upright to save space if needed. To thaw low carb vegetable soup, simply let the bag sit in the fridge overnight (in a container or pot to be safe, in case it leaks! ), then heat on the stovetop. Need ideas for more keto vegetable soup recipes? Try these! 5-Ingredient Broccoli Cheese Soup – A reader favorite… and mine! Or, find more low carb soup recipes here. Ladle – This one has a generous size and the handle is super comfortable to hold. Dutch oven – For the stove top version. 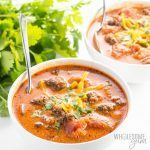 Slow cooker – Only if you want to make your keto friendly vegetable soup in a Crock Pot instead of the stove. Add the minced garlic. Saute for about a minute, until fragrant. Add the cauliflower, green beans, diced tomatoes, broth, and Italian seasoning. Adjust sea salt and black pepper to taste. Add the bay leaves, if using. Click or tap on the image below to play the video. It's the easiest way to learn how to make Low Carb Vegetable Soup! I really liked this soup! Due to time constraints, I cheated by using a bag of frozen pepper onion blend. I also used a small bag of frozen green beans, and a bag of cauliflower florets. I decreased the amount of broth to 6 cups, as I like a thicker soup. It was so tasty with some grated Parm and a drizzle of EVOO before serving. 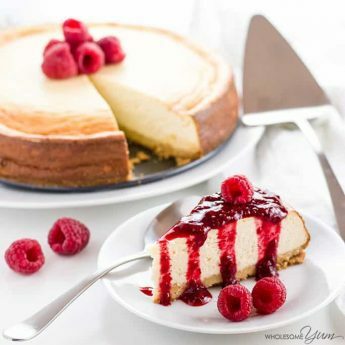 Wow, this is so easy and delicious!! Oh yum! I love slurping a big bowl of good vegetable soup like this. So flavorful, nutritious, and perfect for any weeknight dinner. There aren’t too many things better than a bowl of hot vegetable soup, I loved all of the ingredients for this healthy and low-carb lunch! This was full of so much flavour and is the perfect comfort food! 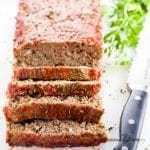 I made a big batch and have frozen the rest – perfect make ahead meal for busy evenings! This is really perfect proper explanation to the veggie soup. We love it and especially winter is just the perfect time to cook. This is a gorgeous soup! After trying this, I will be putting it in my spring rotation! This was so comforting! I love all the herbs and veggies you’ve included! This vegetable soup was so hearty and flavorful! I usually like meat in my soups but this one actually is really comforting and filling. This soup was so easy to make and VERY filling! Excited about my leftovers! I made two of your low-carb soups Vegetable and chicken spaghetti squash soups. They were a hit and really easy to make. Just when we thought spring might be here…whammo! I’m ready for a steaming bowl of veggie soup. I like the cauliflower in this. I never thought about adding it to my usual veggie soup. I love a good vegetable soup! It was my Dad’s specialty and his was fantastic. This soup was delicious as well and I love how quick and easy it was. I fixed it for dinner at the last moment and served it with some fresh baked bread. I know, totally ruined the low carb, but it was soooo good. I could eat this soup every day! So healthy and chock full of satisfying veggies! I used to make some version of bean soup a lot. I tended to put most of the soup in the blender and almost puree for a naturally creamy soup. Any suggestions? Hi Karen, Cauliflower works pretty well for this! You could puree some of this soup, or you can ladle out some liquid with just the cauliflower, puree that, and then return it to the soup. Oh my, this was wonderful. This Vegetable Soup is perfect for the cooler weather. Thanks for sharing the recipe, Maya. What I love so much about veggie soup is most of the time everything is on hand! This looks super yummy because everything in it is yummy AND healthy! Your recipes are awesome. I am looking for a spicy cauliflower chicken wing recipe. Thank you, Beth! You can find buffalo cauliflower wings here! If too salty, would putting in a potato to absorb some of the salt (and remove it later). Would that make it not low carb? Hi Wiletta, I’ve heard mixed things about whether the potato trick really works or is a myth. You can try it if you’d like. The soup would still be low carb if you remove the potato afterward. I have found that an easy way to make soups “creamy” without having to add anything extra is to to take out some of the veggies with a little broth and puree it with a hand blender, then put it back in the soup pot. Delicious! Thank you for sharing, Anne! I like doing that, too!